In the late 1930's, the RAF, faced with a shortage of fighter planes, used the fuselage of the Beaufort bomber to start short-term construction of the twin-engined Bristol Beaufighter. After its maiden flight in 1939, the Beaufighter was used in various roles including interception, bombing and anti-ship warfare. However, the first operational Beaufighters, equipped with Airborne Interception (AI) radar, proved their true worth as night fighters. During the Battle of Britain, the Luftwaffe switched its focus from day bombing to night bombing of London and other major cities in Britain. 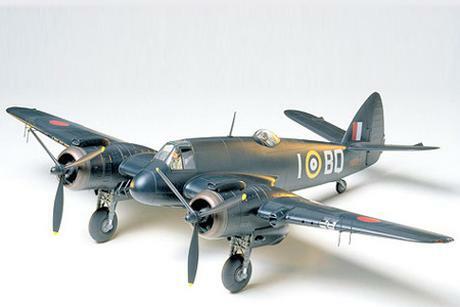 In response to that threat, the RAF first deployed the Blenheim twin-engined night fighters, but they proved unable to effectively intercept the German bombers. It was then, that the more agile, radar equipped and heavily armed Bristol Beaufigher Night Fighter became Britain's new hope in the skies. To enhance stability in later models, the horizontal tall plane was modified to have twelve degrees of dihedral - resulting in a sleek, angular look. In November of 1940, in addition to its role in shooting down the Junkers Ju88 planes, the Beaufighter worked in concert with ground control systems to make great military gains. Although the Beaufighter was replaced by the Mosquito as the RAF's main night fighter in the second half of WWII, its stalwart body and powerful punch earned the trust of many a pilot.